After graduating from Nestucca Valley High School, Nicole Twigg wanted to see the world, or at least more of it. She travelled almost 5000 miles to study abroad in London. In her own words, she “made some good choices and a few bad ones” before “settling down” to earn a degree in Marketing and Communications from Portland State University. It was at PSU where she met her husband, ironically an Englishman, David Twigg. Having experienced life elsewhere made Nicole realize that the small corner of the world she was from, Pacific City, was pretty special. Special enough to move home to and someday start a family. Nicole’s mom, Julie Spencer, owned Kiwanda Coastal Properties, a business she had founded back in 1986. Six years after joining the firm herself, Nicole became a co-owner. With five realtors, all longtime residents of the area, Kiwanda Coastal Properties has a thirty plus year track record of successfully representing buyers and sellers. The company’s principal broker, Barbara Taylor, has been with the firm more than twenty years. But Kiwanda Coastal Properties is also well known as the longest established vacation rental company in Pacific City. Currently managing about fifty beach properties – from inexpensive cabins to large luxury homes – all in Pacific City and Tierra Del Mar, Kiwanda Coastal Properties attracts thousands of potential renters. “Some families have rented from us for decades,” explains Nicole. “Traditionally most of our renters are from the Northwest, but these days we’re receiving inquiries from all over the country through our website and other forms of online marketing.” It’s a rapidly growing market. “For the past several years we’ve had more renters than available houses,” admits Nicole. With several regional and national competitors trying to gain a foothold in the local market, Kiwanda Coastal Properties’ biggest competitive advantage for vacation homeowners is local service. “We have a 24-hour response line and since all our rentals are within three miles of our office, we can take care of problems quickly. That’s something those out-of-town companies just can’t provide,” says Nicole. Kiwanda Coastal Properties employs a year-round vacation rental management staff of 15, 30 in the summer. “Ours is a well-paid loyal team, some of our housekeepers have been with us for more than ten years,” points out Nicole. The company provides a full range of repair and maintenance services for its homeowners, even recommending improvements to keep a property in demand. Despite the company’s long-term success, Julie and Nicole understand that their business has to continually evolve. “It’s a changing world, we need to stay dynamic,” comments Nicole. 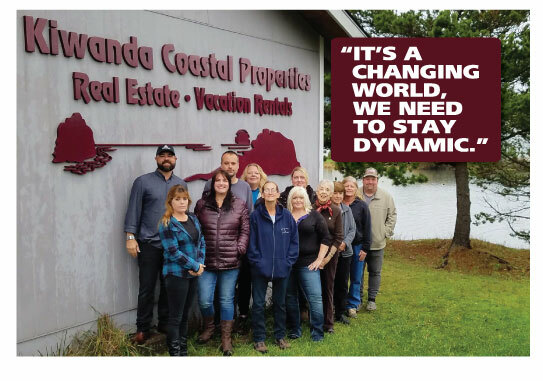 “We focus on technology, marketing and individualized service.” What hasn’t changed is the close relationship that Kiwanda Coastal Properties has with its vacation homeowners. “I know their kids’ names; they know my kids’ names,” says Nicole.